The public continues to favor smaller government and remains critical of government performance. However, some of the anger at government that was evident during the 2010 election campaign has subsided. Overall, 50% say they want a smaller government providing fewer services, while 42% say they would rather have a bigger government providing more services. A majority (55%) also says the government is almost always wasteful and inefficient, compared with 39% who think that government often does a better job than people give it credit for. Not surprisingly, feelings about government divide sharply along party lines, yet there are substantive divisions within the two parties’ broad electoral coalitions as well. And while preferences about the scope of government often correlate with beliefs about the efficiency of government, this is not always the case. Most groups on the right (Staunch Conservatives, Main Street Republicans, and Libertarians) both want to see the size of government shrink and say government is almost always wasteful. Conversely, most Solid Liberals and New Coalition Democrats say they would rather have a bigger government providing more services, and say that government often does a better job than people give it credit for. In contrast to other groups in the Republican constituency, however, Disaffecteds are more divided on the question of size of government. Like other Republican-oriented groups, they overwhelmingly say the government is nearly always wasteful and inefficient (73%). But when it comes to the size of government, they are nearly as likely to favor bigger government as smaller government (42% vs. 50%). These questions also highlight some key distinctions between Hard-Pressed Democrats and other Democratic groups. In stark contrast to these other groups, about two-thirds of Hard-Pressed Democrats (68%) say the government is wasteful, and while a slim majority favors a bigger government (53%), they are more divided about government’s size than their co-partisans. Among Democratic and Democratic-leaning groups, Post-Moderns are the only one in which a majority (55%) favors a smaller government providing fewer services. However, Post-Moderns are not highly critical of government performance: 50% say the government often does a better job than people give it credit for while 45% say it is almost always wasteful and inefficient. 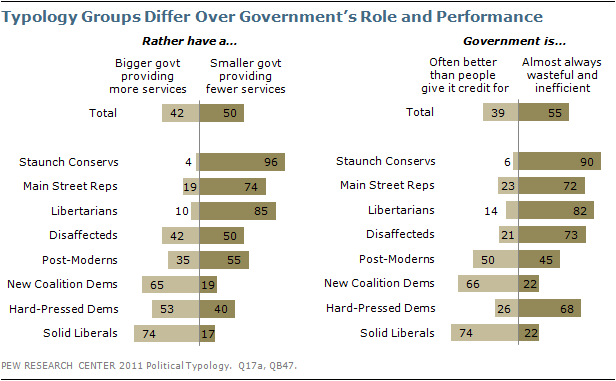 Still, high percentages across all typology groups say they are distrustful of government. Levels of trust vary considerably across the typology. While Post-Moderns are no fans of bigger government, they are relatively trusting: They are the only group in which nearly half (46%) say they trust the government in Washington to do what is right always or most of the time. At the other extreme, nearly all Staunch Conservatives (97%) say they trust the government only some of the time or never. Trust in government is also relatively low among other groups on the right: Just 14% of Libertarians and 19% of Disaffecteds trust the federal government always or most of the time. Main Street Republicans’ views of government are somewhat less negative, but only 28% say they trust the government at least most of the time. On the left, Hard-Pressed Democrats diverge from other Democratic groups in their relatively low level of trust in the federal government; 25% trust government most or all of the time, compared with 40% of New Coalition Democrats and 38% of Solid Liberals. 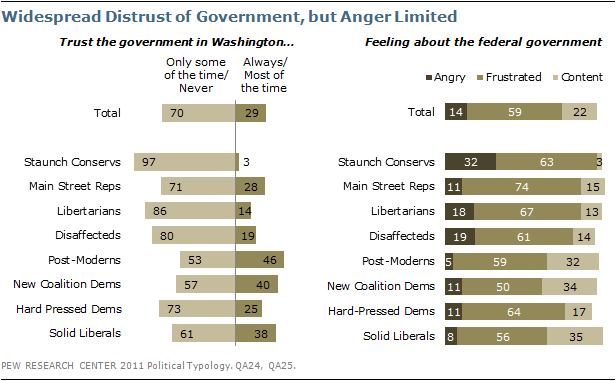 Feelings about the federal government follow a similar pattern, with Staunch Conservatives significantly more likely than any other group to say they are angry with the federal government (32% say this). At the same time Post-Moderns, New Coalition Democrats and Solid Liberals are the most likely to say they are basically content with the federal government (about a third of each group says this). Hard-Pressed Democrats are distinguished from other Democratic groups by their lower levels of contentment with the government. As a whole, Americans are cynical about elected officials, with most saying politicians don’t care what average Americans think (69%) and that they lose touch with voters back home quickly (72%). As with trust and anger, most Democratic and Democratic-leaning groups are less cynical than the Republican groups. There are few significant differences across the Republican and Republican-leaning groups. There is broad agreement about Congress – most groups view it negatively. Across seven of the eight groups, clear majorities give the institution an unfavorable rating. New Coalition Democrats are an exception in their slightly more favorable opinions; they are about equally likely to have a favorable (42%) as an unfavorable (44%) view of Congress. The intensity of negative opinions of Congress varies across groups. Main Street Republicans are more temperate in their criticism than other groups on the right; 16% have a very unfavorable impression of Congress compared with a quarter or more of those in the other three Republican and GOP-leaning groups. Among groups on the left, Hard-Pressed Democrats are the most likely to have very unfavorable views of Congress (27% compared with 17% or less among the other three Democratic and Democratic leaning groups). Solid majorities in six of the eight typology groups say they prefer elected officials who stick to their positions over those who make compromises with people they disagree with. Not surprisingly, this is the overwhelming view of Staunch Conservatives who favor politicians with conviction over those who compromise by a 79%-to-17% margin. In pronounced contrast to other groups, clear majorities of both Solid Liberals (70%) and Post-Moderns (60%) say they prefer politicians willing to compromise over those who stick to their positions. 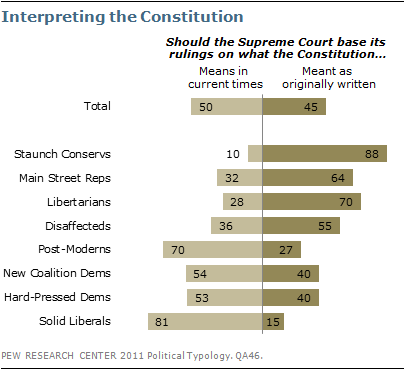 While Americans as a whole are divided over whether the Supreme Court should base its rulings on what the Constitution means in current times (50%) or what it meant as originally written (45%), most typology groups have a clear preference for one of these approaches. To varying degrees, all Republican and Republican-leaning groups favor an originalist approach. By more than eight-to-one, Staunch Conservatives say the Court should base its rulings on its understanding of the Constitution as originally written (88% vs. 10%). Most Main Street Republicans (64%) and Libertarians (70%) also clearly favor this position, although with less consensus. Disaffecteds are somewhat more divided; 55% favor an originalist approach while 36% say the Court should base its rulings on current understanding. On the Democratic side of the political spectrum, Solid Liberals are the strongest proponents of the Court basing its rulings on its understanding of what the Constitution means in current times (81% say this; just 15% favor an originalist approach). The Democratic-leaning Post-Moderns also overwhelmingly favor interpreting the Constitution in the context of current times (70% vs. 27% originally written). New Coalition and Hard-Pressed Democrats are more divided. Slim majorities of both groups say the nation’s highest court should base its decisions on current understanding of the Constitution. The view that the United States is a great nation is widely held across all typology groups. About nine-in-ten Americans say the United States either stands above all other countries in the world (38%) or is one of the greatest along with some others (53%). Just 8% say there are other countries that are better than the U.S. But Staunch Conservatives differ from other typology groups in their view that the United States is superior to all other countries. Two-thirds of Staunch Conservatives (67%) say the U.S. stands above all other nations; they are the only group in which a majority expresses this view. 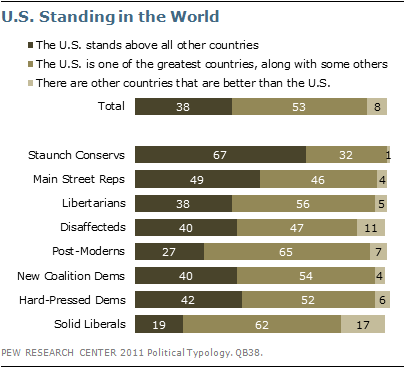 Smaller percentages of Solid Liberals (19%) and Post-Moderns (27%) than those in other groups say the U.S. stands above all other countries. Still, majorities in both groups (62% of Solid Liberals and 65% of Post-Moderns) say the U.S. is one of the greatest countries along with some others. For the most part, the public believes that as Americans we can always find ways to solve our problems and get what we want; 57% express this view. 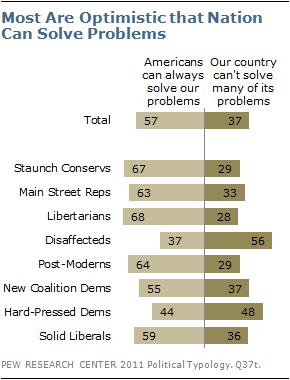 About four-in-ten (37%) say this country cannot solve many of its important problems. Most groups are optimistic about Americans’ abilities to solve their problems, but Disaffecteds are particularly pessimistic: 56% say Americans cannot solve their problems while 37% say they can. Hard-Pressed Democrats also stand out; they are about equally likely to say that Americans cannot solve their problems (48%) as to say they can (44%).